ME Graduate Seminar: Themis Sapsis Ph.D.
Tuesday, Oct 2, 2018, 3:30 – 4:30 p.m.
ABSTRACT: For many natural and engineering systems, extreme events, corresponding to large excursions, have significant consequences and are important to predict. Examples include extreme environmental events: rogue waves in the ocean, flooding events, climate transitions, as well as extreme events in engineering systems: unsteady flow separation, large ship motions, and dangerous structural loads. Therefore, predicting and understanding extreme events is an essential task for reliability assessment and design, characterization of operational capabilities, control and suppression of extreme transitions, just to mention a few. Despite their importance, understanding of extreme events for chaotic systems with intrinsically high-dimensional attractors has been a formidable problem, due to the stochastic, nonlinear, and essentially transient character of the underlying dynamics. Here we discuss two themes in contemporary, equation-assisted, datadriven modeling of dynamical systems related to extreme events: the prediction problem and the statistical quantification problem. For the first theme, a major challenge is the computation of low-energy patterns or signals, which systematically precede the occurrence of these extreme transient responses. We develop a variational framework for probing conditions that trigger intermittent extreme events in high-dimensional nonlinear dynamical systems. The algorithms exploit in a combined manner some physical properties of the chaotic attractor, as well as, finite-time stability properties of the governing equations. In the second part of the talk we develop a method for the evaluation of extreme event statistics associated with nonlinear dynamical systems from a small number of samples. From an initial dataset of design points, we formulate a sequential strategy that provides the ‘next-best’ data point (set of parameters) that when evaluated results in improved estimates of the probability density function (pdf) for any scalar quantity of interest. The approach combines machine learning and optimization methods to determine the ‘next-best’ design point that maximally reduces uncertainty between the estimated bounds of the pdf prediction. We assess the performance of the derived schemes through direct numerical simulations on realistic problems and we discuss limitations of other methods such as Large Deviations Theory. Applications are presented for many different areas, including prediction of extreme events in turbulent fluid flows and ocean waves, and probabilistic quantification of extreme events in fluid-structure interactions. SPEAKER BIO: Dr. Sapsis is the Doherty Associate Professor of Mechanical and Ocean Engineering at MIT, where he has been a faculty since 2013. He received a diploma in Ocean Engineering from Technical University of Athens, Greece and a Ph.D. in Mechanical Engineering from MIT. Before becoming a faculty at MIT, he was appointed Research Scientist at the Courant Institute of Mathematical Sciences at New York University where he worked on stochastic methods for turbulence. 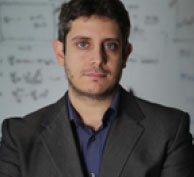 Prof. Sapsis work lies on the interface of nonlinear dynamical systems, probabilistic modeling and data-driven methods. He has numerous contributions on the development of robust and efficient statistical prediction algorithms that take into account the challenges and constraints imposed by real world problems, primarily motivated by ocean engineering applications. He has published in the areas of uncertainty quantification for turbulent fluid flows in engineering and geophysical systems and his methods and algorithms have been extensively adopted and applied by others in fields such as data assimilation and filtering, CFD and optimization, probabilistic dynamical systems and others. A particular emphasis of his work is the formulation of mathematical methods for the prediction and statistical quantification of extreme events in complex engineering and physical systems such as extreme ship motions, extreme mechanical vibrations, rogue waves in the ocean, and hot-spots in turbulence. He is the recipient of three Young Investigator Awards (ONR, AFOSR, ARO), as well as the Alfred P. Sloan Foundation Award for Ocean Sciences.